For the dairy industry, the options for producing a late-summer emergency forage crop are limited, mostly because the growing season is relatively short. Traditionally, fall-grown cereal grains can fill this niche; however, most studies evaluating their use address specific management issues related to the backgrounding of stocker cattle, especially within the Southern High Plains. Generally, these efforts have emphasized the use of winter wheat as a fall forage, which then may be utilized as either a forage or grain crop the following spring. Unlike the Southern High Plains, dairy producers in Wisconsin are not bound by this production paradigm, and they largely desire to maximize yield, while maintaining forage quality suitable for either lactating dairy cows or dairy replacement heifers. Recent work conducted at Prairie du Sac (WI) during the fall of 2006-2007 (Coblentz and Walgenbach, 2010) has demonstrated that some cereal grains (primarily oats) planted in early August will joint, elongate, and produce a visible seedhead before winter, while others, such as winter wheat or rye, remain vegetative (do not joint) until the following spring. (Please note that these comments do not necessarily apply to true spring-wheat cultivars.) If maximizing the production of emergency fall forage is a critical management goal, oat cultivars are preferred selections, and they can be expected to produce a 2:1 yield advantage over wheat cultivars that remain vegetative until spring (Figure 1). One potential disadvantage of this approach is that oat cultivars will not survive the winter; therefore, their entire forage production will occur before winter, while winter wheat or rye will produce most of its forage DM the following spring. Therefore, dairy or beef producers need to make an informed decision about which management approach best fits their production goals. This Focus on Forage report will assume that the primary production objective is to maximize fall growth, specifically to fill a projected forage-inventory deficit before winter. On that basis, it will exclude wheat and rye, and concentrate specifically on management techniques for fall-grown oats only. Furthermore, all comments will assume that forage cultivars were planted at a rate of 3 bushels/acre, and fertilized with about 40 lbs N/acre. Which oat cultivars should be selected? In Wisconsin, oat cultivars are often classified on the basis of maturity rating (early, mid, or late-season) and projected use (grain or forage type). Mostly, the maturity characteristics exhibited by oat cultivars following late-summer plantings are consistent with those published for University of Wisconsin small grain variety trials (Mochon et al., 2009) that are based on spring establishment. In other words, a mid-season cultivar (e.g., Ogle) will mature more rapidly than a very late-season cultivar (e.g., ForagePlus), regardless of growing season (spring or fall), or planting date within season. Two other characteristics of oat cultivars also are important to note. First, cultivars selected specifically for production of forage (e.g., ForagePlus) generally exhibit much slower maturation characteristics than grain-type cultivars. Secondly, oats has a long-day photoperiod requirement for flowering that is disrupted by a late-summer planting date. As a result, the maturation rate for all cultivars is generally much slower in the fall, and differences between cultivars of diverse maturity classes tend to be more separated. For example (Figure 2), following an August 1st planting date, an early-maturity, grain-type oat (Dane) displayed a visible seedhead by October 1st, but the forage-type cultivar (ForagePlus) never progressed beyond boot stage through mid-November, which was about six weeks later. Following traditional spring establishment, the difference in heading dates between these two cultivars is about two weeks (Mochon et al., 2009). When should fall oats be planted? There is considerable flexibility with respect to planting dates for fall-grown oats; however, the appropriate selection of a cultivar varies depending on whether the planting date is early (mid-July through the first week of August) or late (after the first week of August). 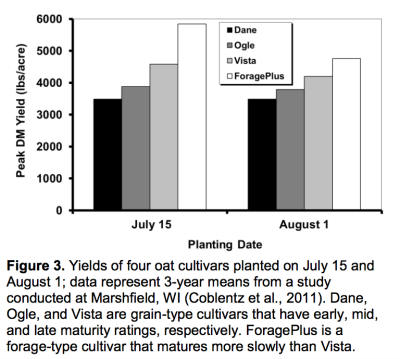 Early Planting: Based on the results of a recent 3-year trial conducted at Marshfield (WI) during 2007- 2009 (Coblentz et al., 2011), yields of fall oat forage are likely to be greatest with a late-maturing, forage-type cultivar if planting dates occur during mid-to-late July. This yield advantage will likely persist through the first week of August (Figure 3). In this study, the forage-type cultivar (ForagePlus) matured more slowly than grain types, and often was better able to take advantage of erratic late-summer precipitation. Under these same circumstances, an early-season, grain-type cultivar, such as Dane, often tillered very poorly and produced a seedhead prematurely, thereby resulting in poor yields. Mid- and late-maturing grain-type cultivars (Ogle and Vista, respectively), produced yields that were intermediate between Dane and ForagePlus. From a practical perspective, ForagePlus remained structurally upright and physically suitable for a single harvest as silage throughout the month of October. In contrast, rapidly maturing grain-type cultivars often lodged and/or deteriorated physically after October 1st, which limited their suitability for harvest as a silage crop. Late Planting: If planting is delayed beyond the first week of August, earlier-maturing, grain-type cultivars will likely produce greater forage yields than ForagePlus or other forage-type cultivars. This occurs because the time interval between planting and the onset of winter weather is relatively short, and the slower maturation characteristics of forage-type cultivars become an increasing liability relative to faster-maturing, grain-type cultivars. 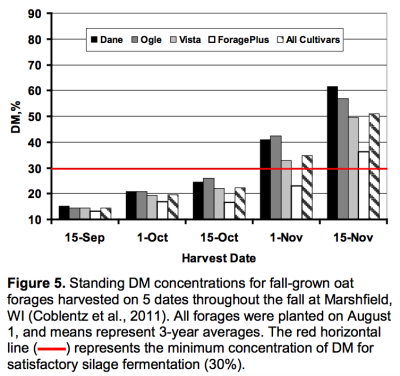 This can be illustrated from the results of the study conducted at Prairie du Sac during 2006-2007 (Figure 4) in which all cultivars were planted about August 12th.In that study, fall forage production from Ogle (mid-maturity) oats harvested on November 1st exceeded ForagePlus (very late maturity) by >1100 lbs DM/acre, which converts to an approximate equivalent of 11⁄2 tons of silage/acre at 66% moisture. Although growing conditions vary from year to year, establishing oat cultivars for forage after about August 15th is risky, and generally cannot be recommended unless immediate germination and emergence can be ensured via irrigation or other management techniques. How much yield can be expected? Fall grown oats have great potential, but results can be highly variable from year to year, and two weather-related factors appear to be critical for maximizing yields. Perhaps the most important factor is ensuring that adequate soil moisture exists to facilitate quick germination. Slow germination because of severe drought or poor planting techniques will greatly reduce production, even if soil moisture improves through precipitation later in the fall. Secondly, relatively mild weather through mid- and late-October will permit continued growth and development of oat plants; this is especially important for slow-maturing cultivars, such as ForagePlus. With good management, peak forage yields will likely range from 4000 to 6000 lbs DM/acre (Figures 1, 3, and 4) during most years, which converts to a 6 to 9-ton/acre silage equivalent at 66% moisture. However, we have measured silage-yield equivalents within some experiments conducted at Marshfield that ranged from about 3 to 131⁄2 tons/acre. Therefore, while greater yields are possible, considerable variability can be expected across years and/or locations. Peak yields occurred when establishment occurred during late-July or early-August. However, yields can be expected to decrease sharply if planting dates are delayed into mid-August or later. Can Fall Oats be Direct Cut? Generally, fall-grown oats will reach the minimum DM concentration suitable for direct ensiling (> 30%) while still standing, but this also is dependent on both cultivar and planting date. Following an August 1st planting date at Marshfield (Figure 5), all varieties had less than 30% DM until November 1st. 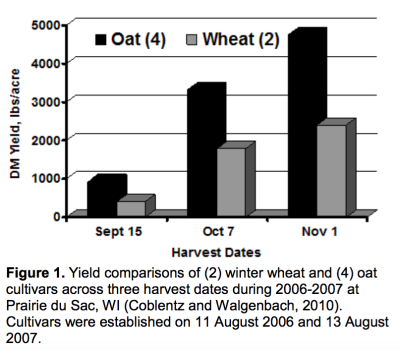 On that harvest date, all three grain-type cultivars within the study (Dane, Ogle, and Vista) had greater than 30% DM until approximately two weeks later. When the same oat cultivars were planted on July 15th, all grain-type cultivars could be ensiled directly by October 1st, but ForagePlus was not sufficiently dry until November 1st (data not shown). With a much later August 15th planting date, no grain-type cultivar reached the threshold for acceptable silage fermentation until about November 15th. Although helpful, these guidelines don’t consider forage quality needs or targets, as well as other weather-related factors, such as snow or ice storms that may limit the reliability of harvest, particularly throughout November. Therefore, while standing oats may dry to allow direct ensiling, it may be necessary to wilt oat forages before harvesting as silage. 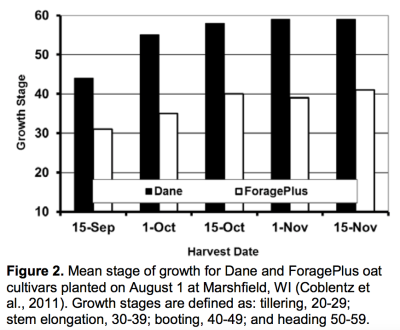 Research results show that the very late-maturing, forage-type cultivar ForagePlus is likely to maximize yields when planting dates are extended as late as the first week of August (Figure 3). However, if planting dates are delayed beyond the first week of August, it is likely that more rapidly maturing grain-type cultivars will produce greater yields before winter than forage-type cultivars (Figure 4). With good management techniques, producers can expect yields of DM ranging from 4000 to 6000 lbs DM/acre, but yields may vary across years and/or locations. Rapid germination and emergence is an important key to maximizing yields. During most years, significant depressions of yield will be observed if establishment is delayed beyond the first week of August, and it is difficult to recommend planting dates later than about August 15th, especially within central Wisconsin. Coblentz, W.K., M.G. Bertram, and N.P. Martin. 2011. 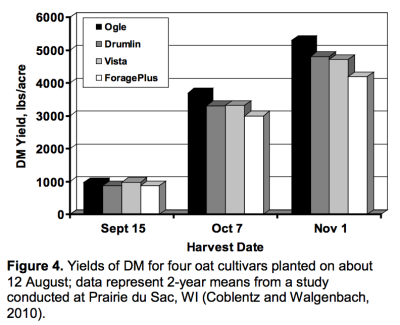 Planting date effects on fall forage production of oat cultivars in Wisconsin. Agron. J. 103:145-155. Coblentz, W. K., and R. P. Walgenbach. 2010. Fall growth, nutritive value, and estimation of total digestible nutrients for cereal-grain forages in the north-central United States. J. Anim. Sci. 88:383- 399. Mochon, J., S. Conley, and H. Kaeppler. 2009. 2010 Wisconsin oats and barley performance tests. Publication #A3874. Univ. of Wisconsin Cooperative Extension Service, Madison, WI.